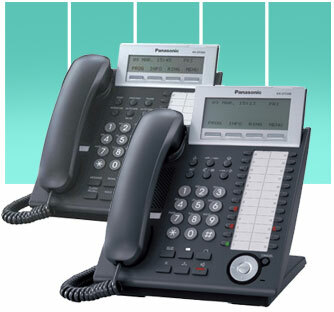 Panasonic introduces the new KX-DT300 Digital Proprietary telephone series that are stylish, intuitive, user friendly and follow universal design philosophy making them highly appealing, easy and comfortable to use by all system telephone users. Ergonomically designed with features and functions to enhance users daily productivity, they are ideal for many applications including contact center agents, hotel rooms, to advanced desktop applications supporting a range of wired and Bluetooth headsets. The KX-DT300 Series Digital Proprietary telephones provides a range of advanced features and functionality, communications productivity and customer care. This advanced range integrates with Panasonic KX-TDA and KX-TDE as well as integration with the advanced KX-NCP Network Communications Platforms - allowing quick access to the entire spectrum of phone system features and applications. This range of easy to use, advanced business class telephone devices are designed for effective daily communications. Connected to Panasonic telecommunications systems, they provide a wide range of features to support the right solution for all your business applications. These telephones offer superb voice quality thanks to handsfree speakerphone and integrated headset port. The sleek, ultra-modern design, available in both black and white colour options, works well with any office decor. Packed with a whole host of features, the KX-DT300 Series Digital Proprietary telephones could not be more simple to use. The phones have large alphanumeric displays, programmable keys, Bluetooth module providing wireless headset support, easy navigation key, and double tilt adjustment (separate control for phone base and LCD display) for enhanced desktop usability and comfort. Used in combination with the Panasonic PBX, the newly designed Digital Proprietary Telephone with its rich array of features will enhance the efficiency of your business. One-touch programmable soft keys save time and effort. These keys can be used to store telephone numbers, or access frequently used phone system features. The dual colour Red/Green LED's give visual indication of accessed feature status, CO lines, as well as the status of colleagues (Idle, Busy). The telephone base and LCD has independent multiple points of tilt adjustment for maximum visibility at any angle.